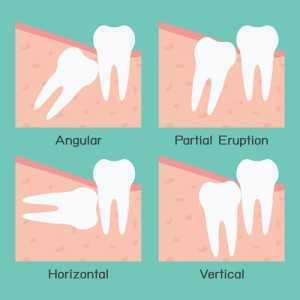 Wisdom teeth usually grow from late teens to early adulthood years and tend to be misaligned and problematic. For this reason, a majority of people undergo wisdom teeth removal. Wisdom tooth extraction can be done in a dentist’s office or in an oral and maxillofacial surgeon’s office. Multiple extractions or extractions in patients who are prone to health complications can be done in a hospital. Though wisdom tooth removal usually requires the use of a local anesthetic, for multiple extractions, a general anesthetic may be administered. A general anesthetic works by numbing the body and putting you to sleep. If the dentist decides to use general anesthetic, he will recommend that you abstain from eating and drinking after midnight. If they break halfway, this will cause your gum tissue to create a flap around the teeth. When food gets trapped in the flap, your gums can get infected. Your wisdom tooth could grow in horizontally. Crowding, which will impact the adjacent teeth. You can also opt for preventive removal, as removing wisdom teeth does not impact health. It’s easier to extract a wisdom tooth before age 25 because the roots haven’t fully formed by this age. To perform the extraction, the dentist will have to make an incision in the gums, take out any bone that’s covering the tooth and then remove the tooth. If the extraction proves to be too difficult, the dentist will section the tooth into small pieces to make it easier to extract. After the removal is completed, the incision is then stitched back together. A majority of patients who undergo wisdom tooth removal recover a few days after surgery. Any pain resulting after surgery can be managed with pain medication. Gently bite down on gauze every so often and replace the gauze when it gets soaked. In case bleeding persists 24 hours after extraction, consult your dentist. Avoid biting the insides of your lips, cheeks and tongue when your mouth is numb. The open sores will get painful when the anesthetic wears out. You will also get infections. When sleeping or lying down, prop yourself with pillows. Lying flat will prolong the bleeding. Hold an icepack against your cheek a few times during the day. Leave the icepack in place for up to 20 minutes. Do not take part in intense physical activity after surgery. Avoid hard foods. Stick to soups and other soft foods for the first few days after surgery. Only go back to eating solid foods when you’ve completely healed. Don’t drink from a straw as the suction will cause the blood clot on the wound to come loose. Rinse your mouth a few times daily with salty water. This will reduce swelling and pain and prevent infections. Avoid smoking for up to 24 hours after surgery to prevent the introduction of germs into your mouth. Smoking also decreases blood supply and this is bad for healing. Do not run your tongue over the area or touch it as this will cause infections. Be careful when brushing so that you don’t graze the area. Use anti-bacterial mouthwash to kill bacteria that might have accumulated in the area.